Ahh, the learning game. 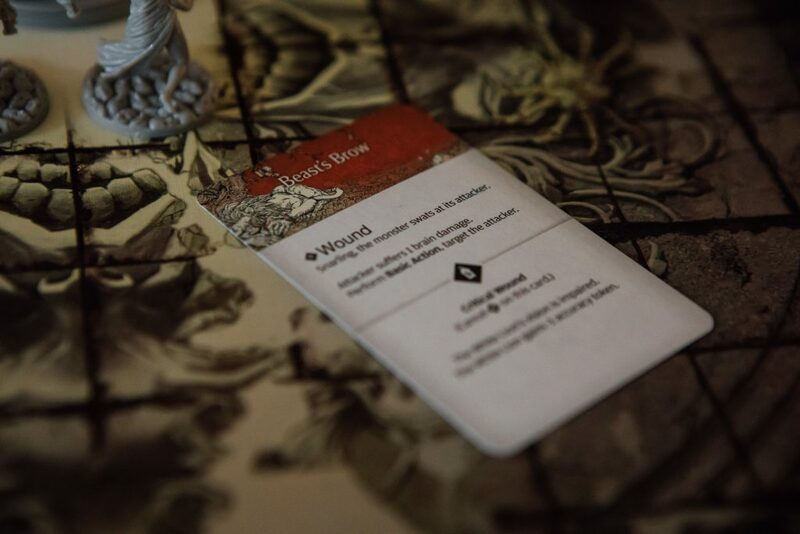 Staple of almost every board game ever… especially ones as involved as this, although even the Kingdom Death: Monster prologue pulls no punches. 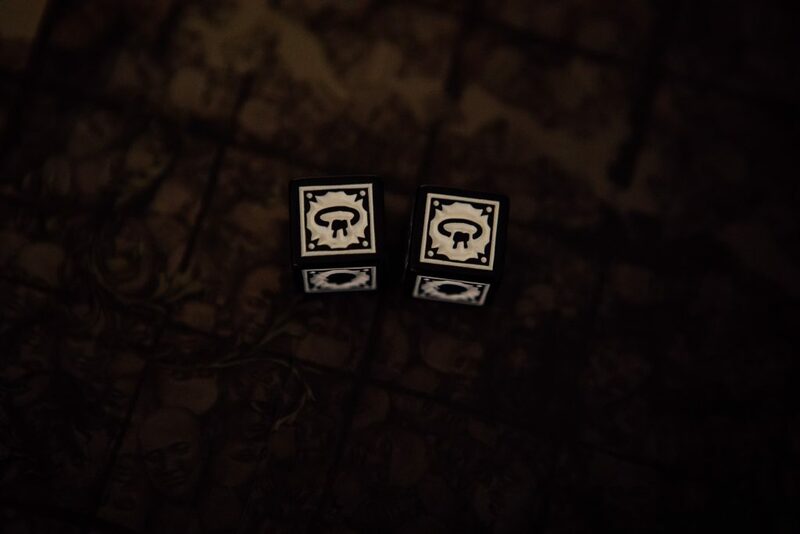 You can read more detailed impressions of this weird, dark, astounding behemoth here, and in time we’ll follow up with a proper campaign, but for now let’s settle on this. 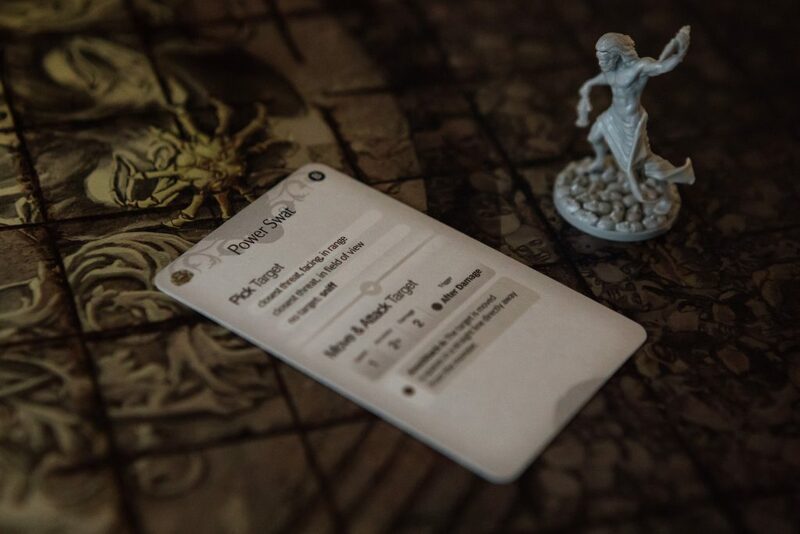 What follows is a playthrough of the Kingdom Death: Monster prologue mission (so: minor spoilers ahead). 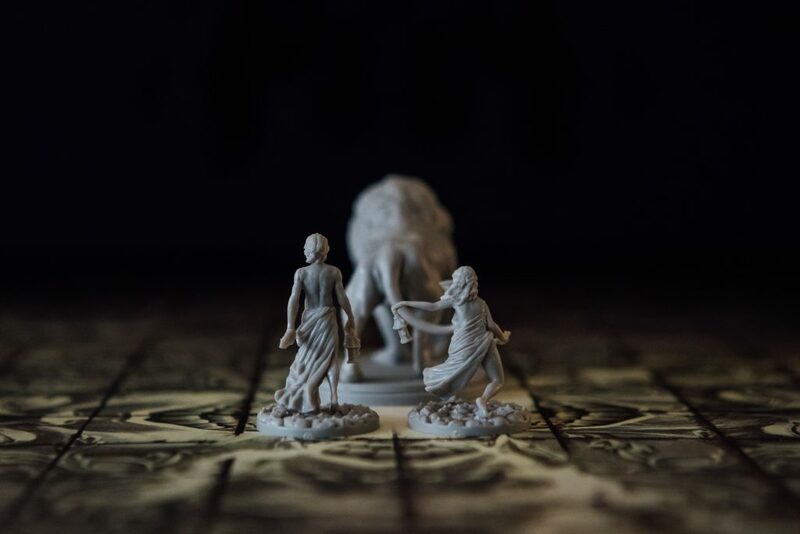 We planned for this to be a brief overview of what can happen in a typical showdown, although as you are about to read, nothing in Kingdom Death: Monster is straightforward. 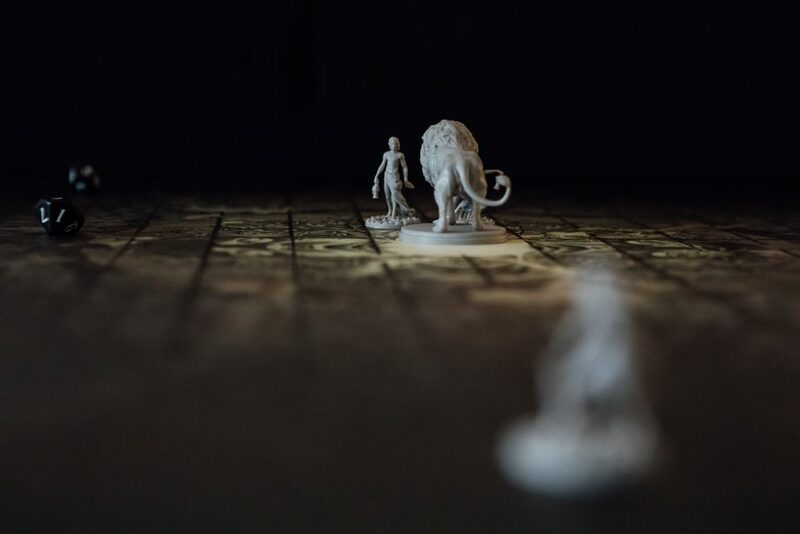 Monster: CLAW – the lion moves to Rand and attacks, hitting him on the body and leg (and giving him +1 insanity as Rand is monster controller). 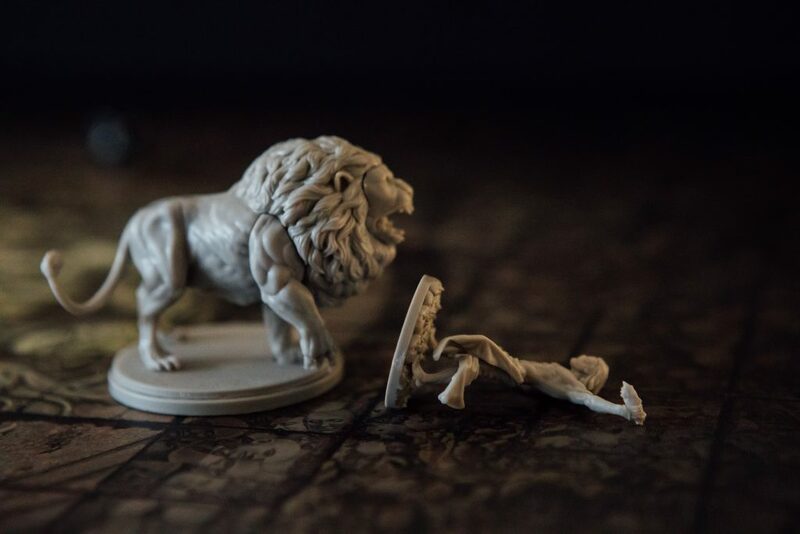 Rand flings his founding stone directly at the lion, scoring a critical hit but losing the stone in the process. The hit location is Strange Hand – which, as it’s a critical, means the lion’s hand is hacked off. 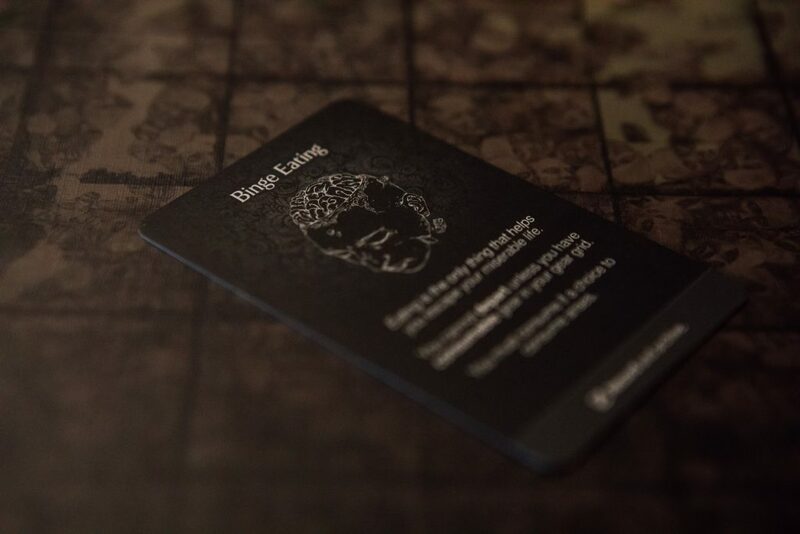 Rand spends 1 survival to gain +1 permanent strength as detailed on the card. Rand moves round the side to flank the lion. Egwene moves into the lion’s blind spot, gaining +1 accuracy to the attack (which reduces the number she needs to roll to hit the lion). 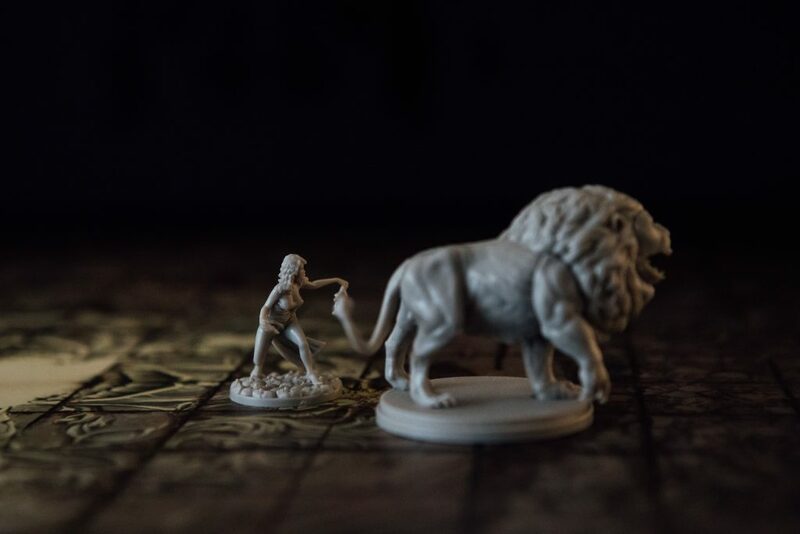 Egwene uses her own founding stone to attack, which results in two hits… destroying the lion’s jaw, and giving her +1 courage and +1 survival. That is definitely going to sting. And make restaurant trips awkward. 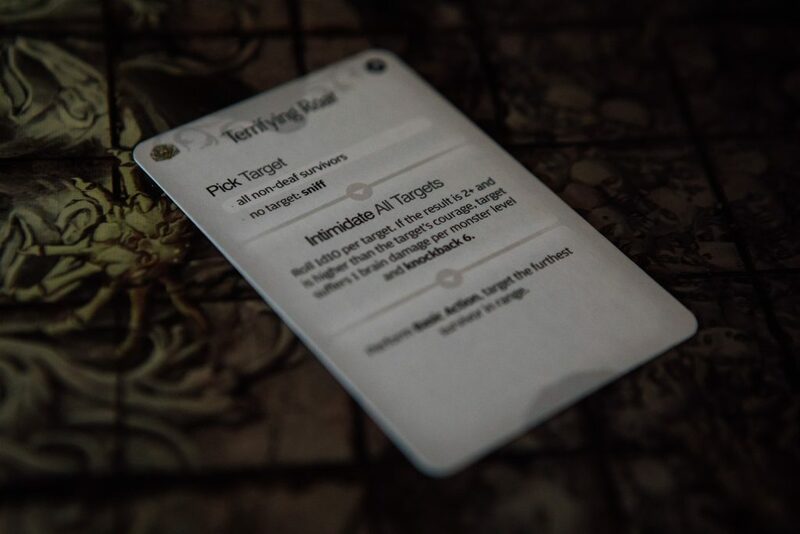 Perrin moves into the blind spot, joining Egwene and attacking to wound the beast’s chest. 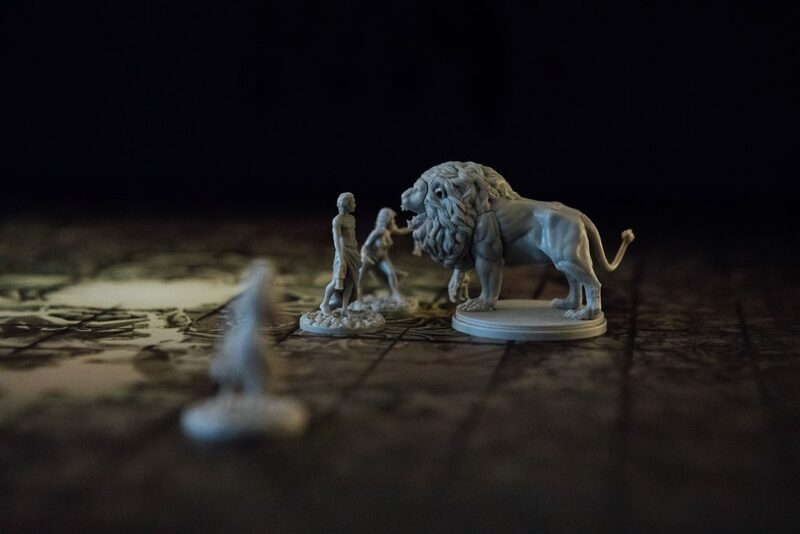 Elayne remains directly in front of the lion, hoping to draw its next attack. Using her founding stone, she lashes out at its Fuzzy Groin, but fails to do enough damage to do anything other than mildly excite the lion. 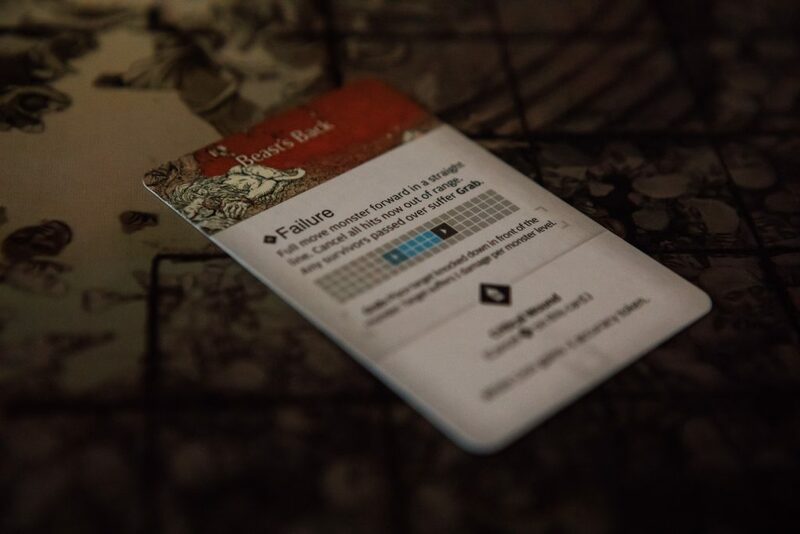 Monster: TERRIFYING ROAR – all survivors are targeted by this, suffering 1 brain damage and being knocked back 6 spaces, instantly scattering them. Egwene isn’t a huge fan of this move, so hops back round to the lion’s blind spot, attacking its Straining Neck but again, not hitting hard enough to do any damage. 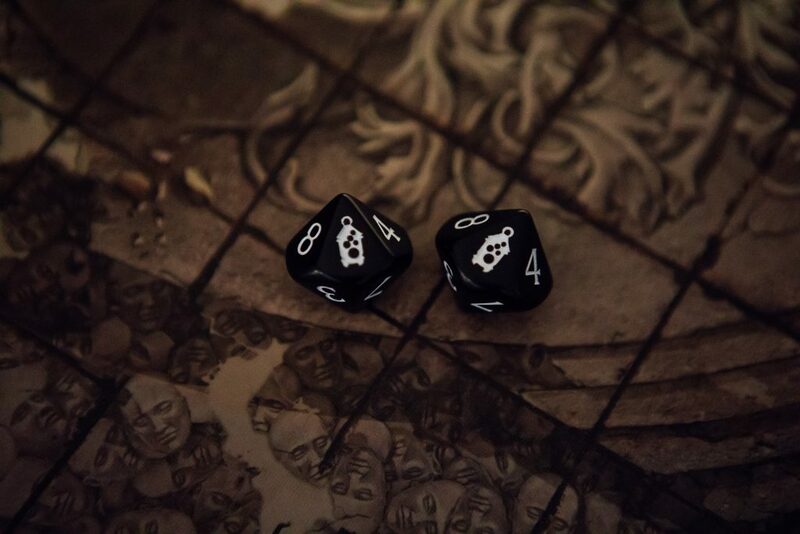 Perrin follows suit, in more ways than one – scoring one hit to the Beast’s Brow, but also failing to do any damage. Rand & Elayne are too far from the action to achieve much, so can only move closer to the lion… bloody terrifying roar. Monster: POWER SWAT – pointed in Rand’s direction. This is a 1 speed attack, which results in 1 hit. 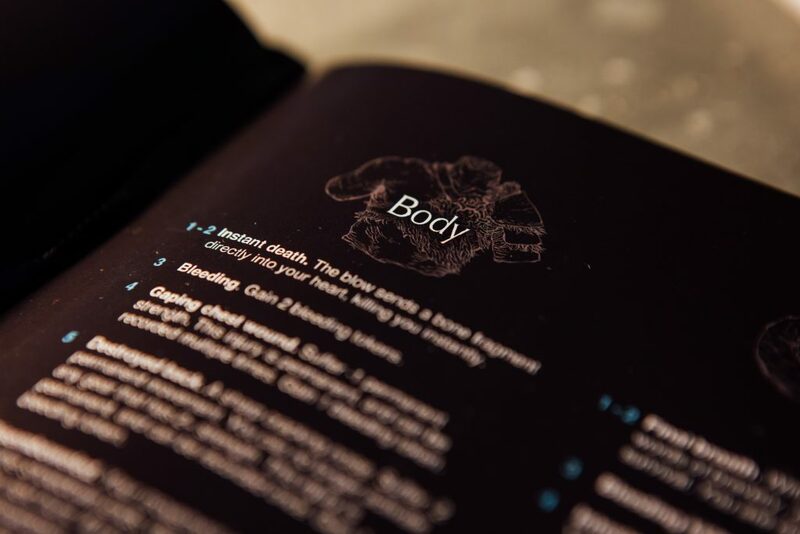 But it does 2 damage, which is problematic when the hit location has any existing damage – like the body, for example. This hit lands on top of Rand’s light injury, causing both a heavy injury AND a severe injury. As Rand so intelligently spent his survival early doors on the +1 strength, he now has no ability to dodge this. Instant death! A bone fragment goes through Rand’s brain, killing him instantly. That +1 strength achieved absolutely nothing. 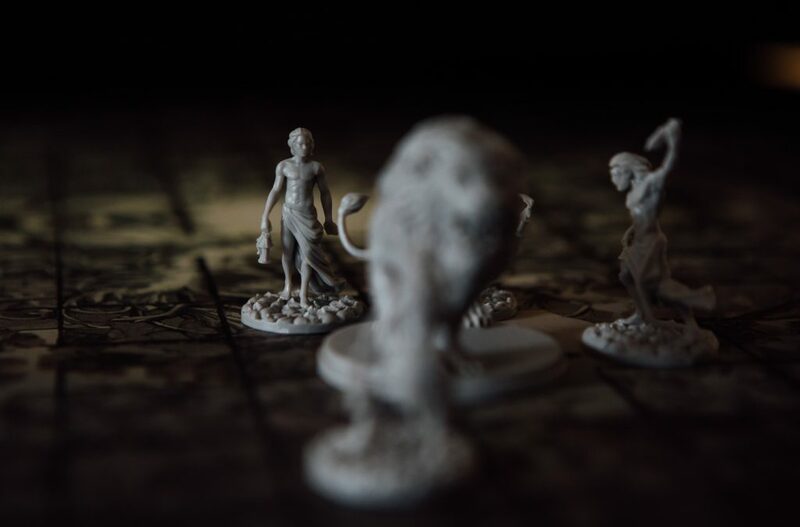 But it’s only the Kingdom Death Monster prologue – it’s only a learning game, right? Egwene, undeterred, moves into the blind spot, and manages to land two hits in retaliation! She first wounds the Beast’s Elbow, before trying – and failing – to hit the Beast’s Back. The lion has a reaction to this failure, moving forwards at full pace, sending it COMPLETELY OUT OF REACH OF EVERYONE. Perrin & Elayne can only move closer, now the monster is out of reach. 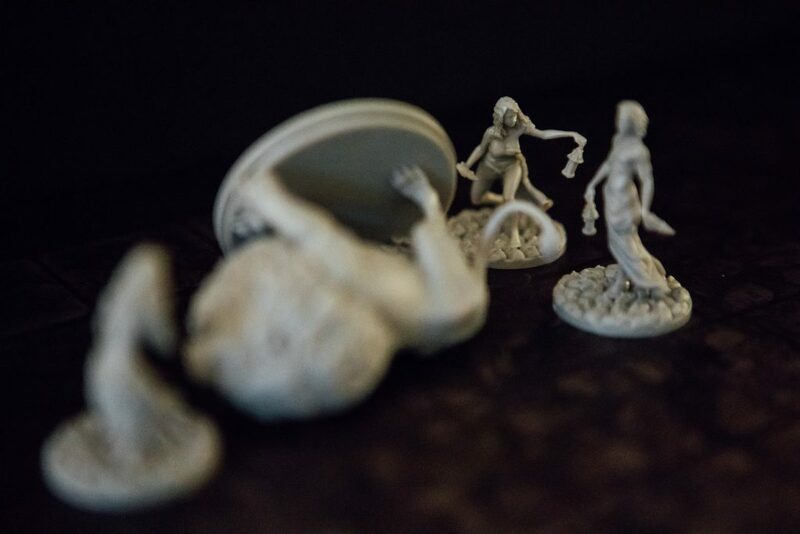 …and then hauls him away from the other survivors to the edge of the board. Also, Perrin suffers more damage to the body. 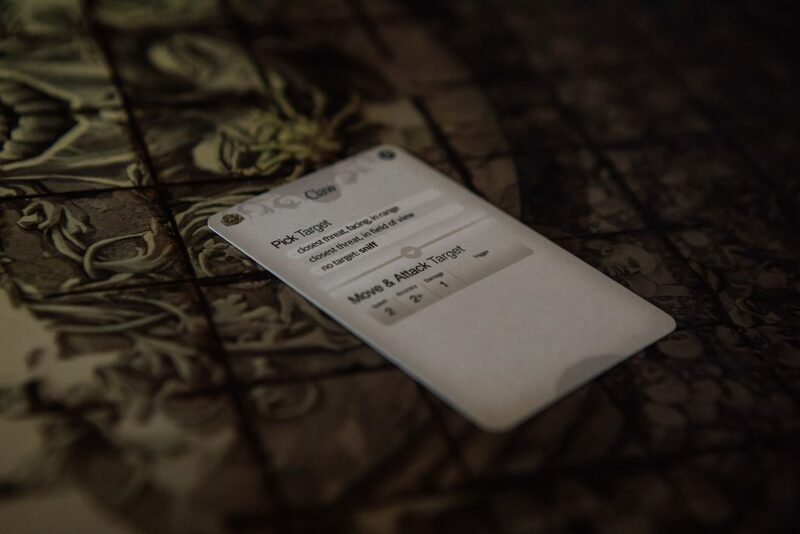 At this point the lion still has four AI cards – both its action deck and a measure of its health – remaining. Egwene moves to the lion’s right flank but misses completely with her attack. Elayne moves in too but due to the lion’s previous movement is still too far away to connect. Monster: TERRIFYING ROAR – more widespread brain damages and being knocked back. Great. Perrin must now go to the brain trauma table, rolling a 7 to earn himself ‘lunacy’ that leads to a random disorder of binge eating. Oh, and +4 insanity. 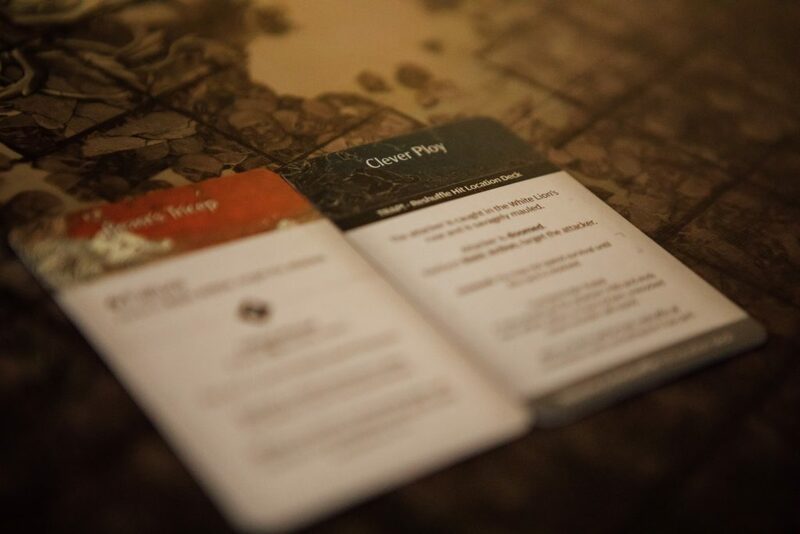 Survivors are ALL now out of range so everyone simply moves closer… again. Monster: POWER SWAT – the lion uses its big gun against Perrin, hitting him and forcing him to spend a survival point to dodge a hit that would make him roll on the serious injury table. Instead, he is knocked down AGAIN and knocked back six spaces. Elayne also goes to the blind spot but opts for her signature move of not rolling high enough to damage the lion. 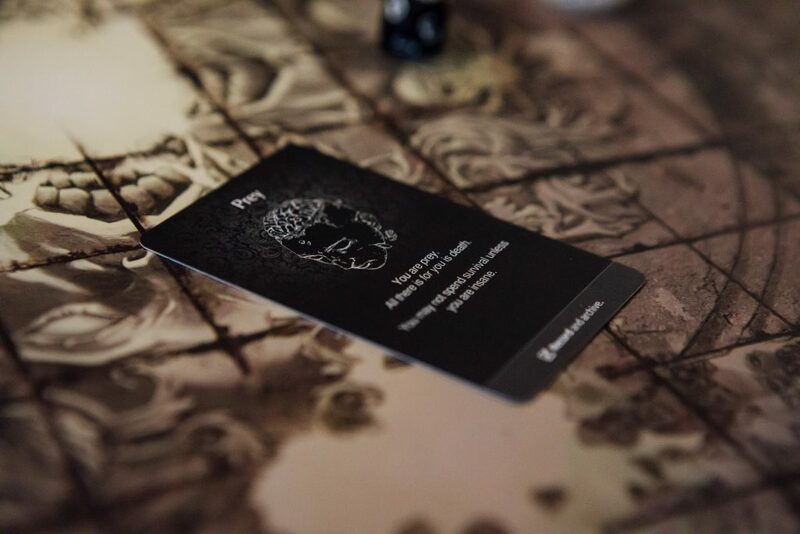 Monster: GRASP – For what feels like the millionth time, Perrin is attacked, damaged, and dragged into the darkness. The AI deck is shuffled. 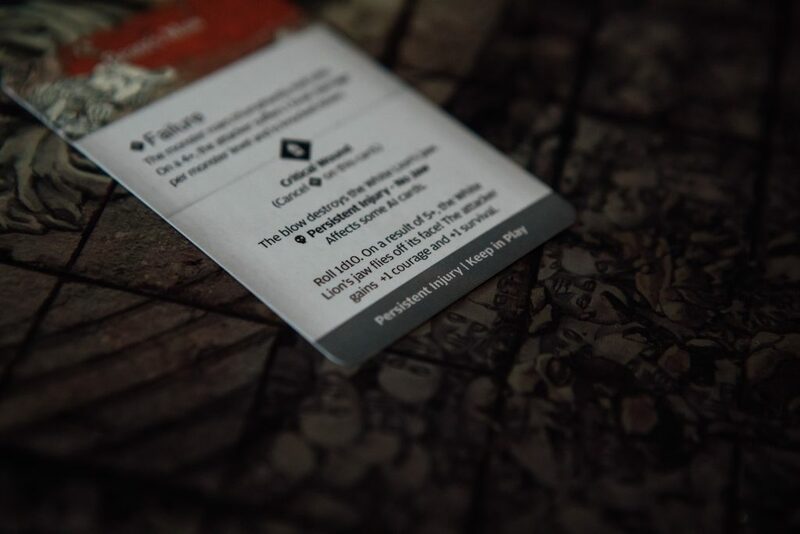 Survivors are AGAIN out of range so guess what? Yes, they move closer. 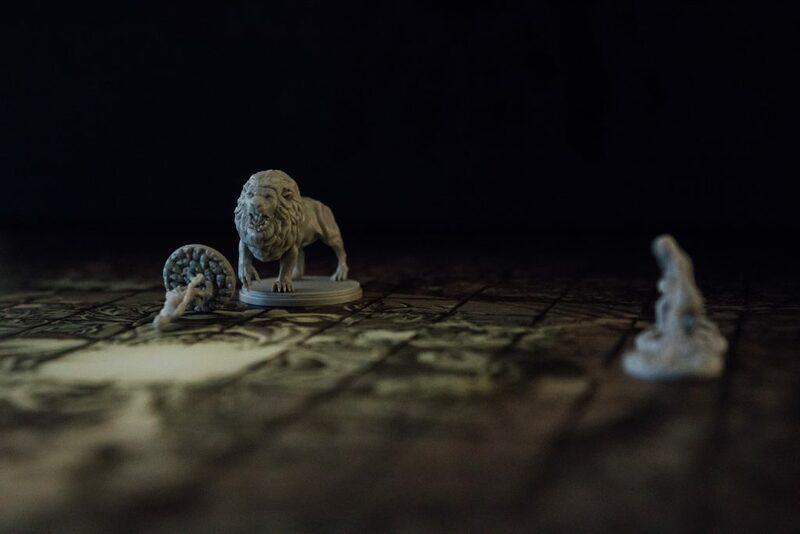 Monster: GRASP – this will shock you, but the lion goes for Perrin, dragging him off and causing a severe injury. The ensuing concussion earns Perrin the ‘prey’ disorder (and one bleed token). Perrin then stands up. He has had enough. The worm is turning, this dog is having its day and so on… THE TIDE WILL TURN, LION. 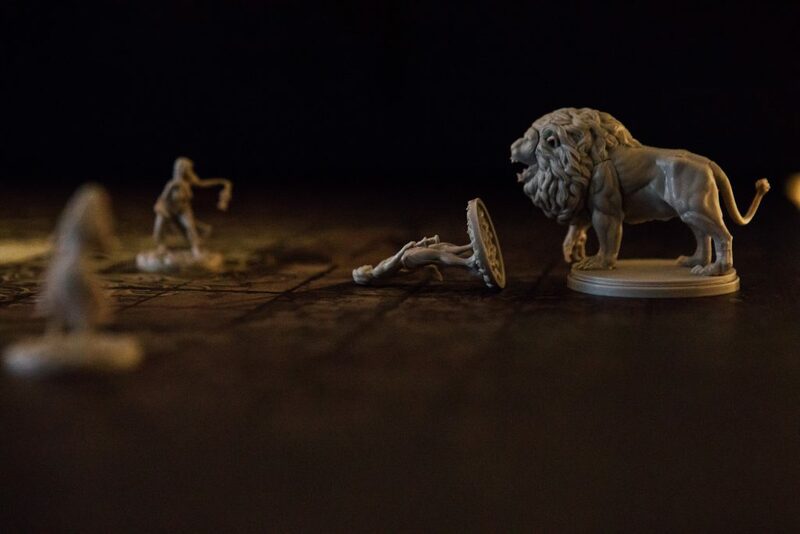 He launches his founding stone at the lion, scoring a critical hit on the Beast’s Femur. This results in -1 movement for the lion and a random white lion resource, (great cat bone). Perrin, for once still standing, legs it in the hope that he isn’t targeted again. 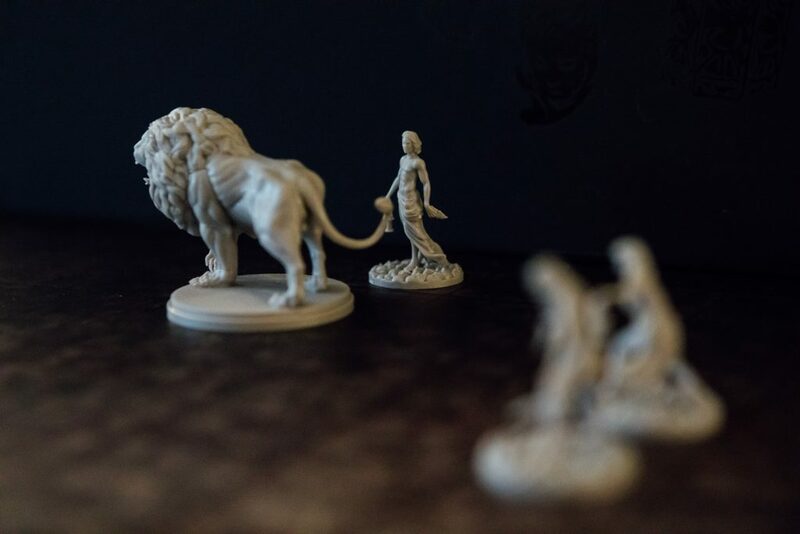 Egwene is inspired to fling her own founding stone, scoring a critical hit on the lion’s Scapular Deltoid – fractures the lions shoulder and further reducing its movement by -1. Elayne joins the party, throwing her founding stone too and hitting the Glorious Mane (gaining a shimmering mane resource). 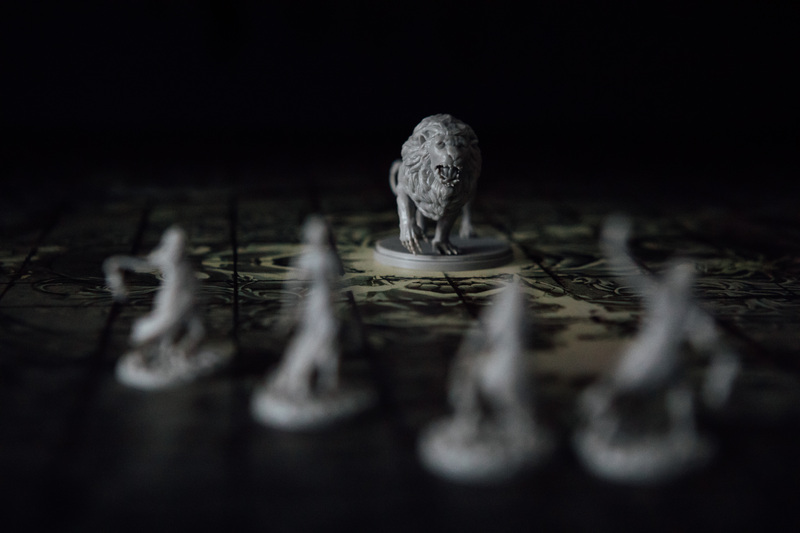 After three wounds in one round, the lion only has the basic attack and a move of 4 left. Finally. Monster: BASIC ATTACK – but what’s this? The lion targets Perrin but with only four movement it can’t make it, and ends its turn. How’d you like them apples, Mr Lion? Perrin moves in to flank the lion. As he’s thrown his founding stone he must attack unarmed – using Fist & Tooth. 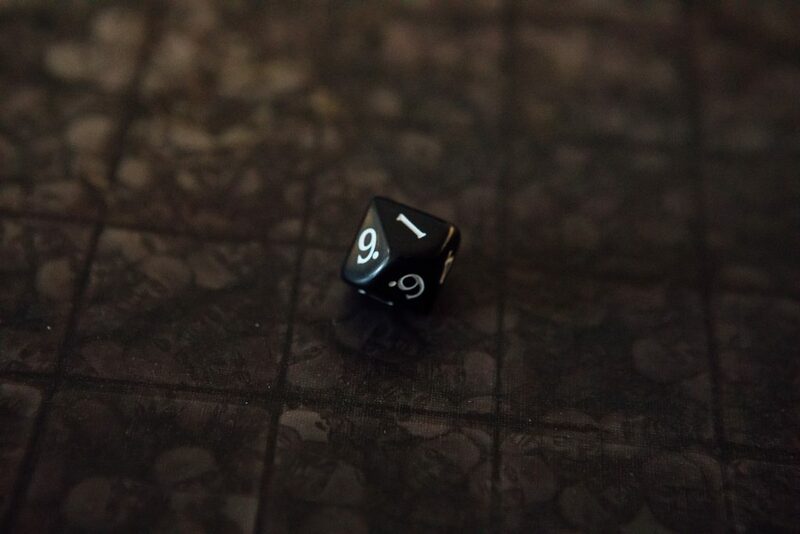 This needs an 8+ to hit… it doesn’t hit. Elayne & Egwene are both out of range so move closer to the lion. 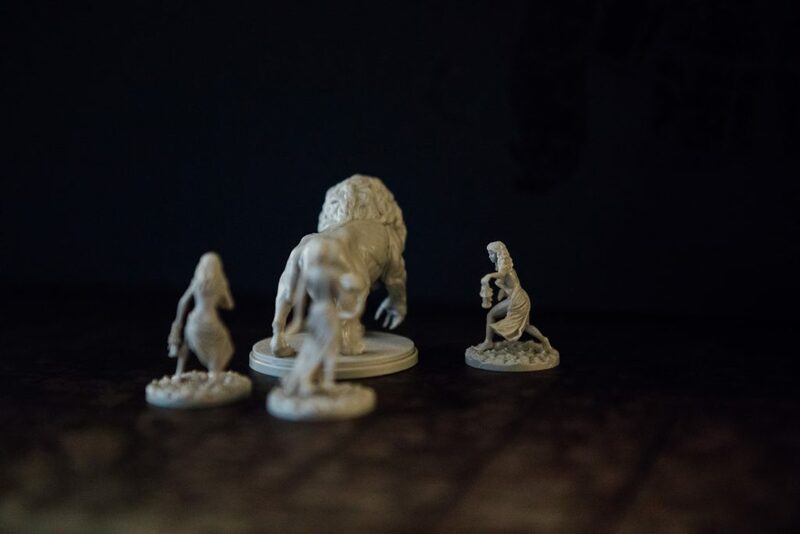 Monster: BASIC ATTACK – the status quo is restored as the lion attacks Perrin once more, rolling two perfect hits that really make a mess of Perrin’s waist (and loincloth). 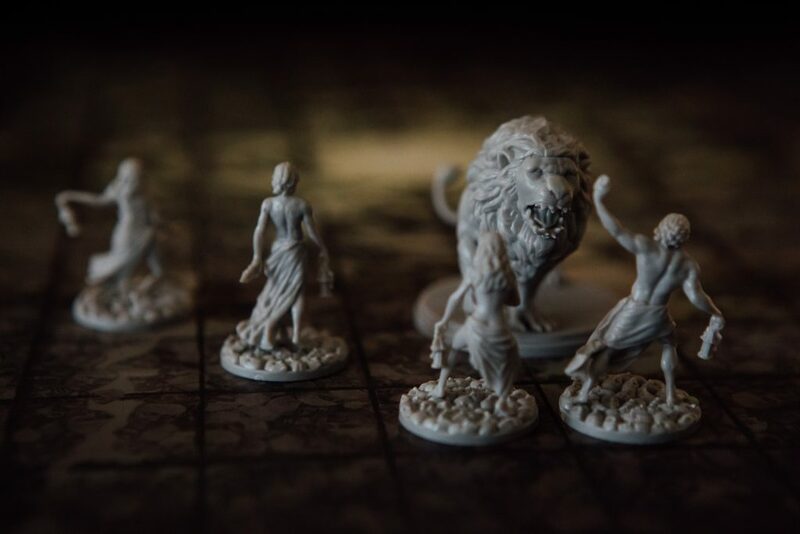 Elayne, Perrin and Egwene rush to surround the lion, attacking him from all sides… and missing. 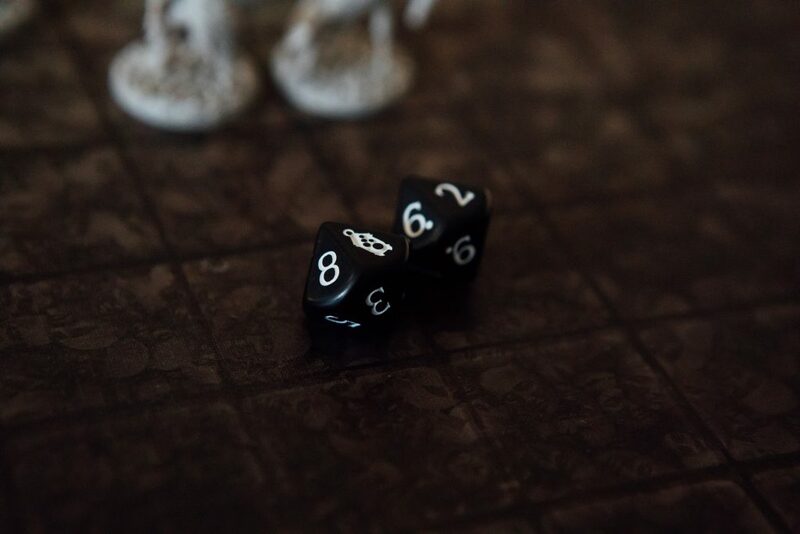 Monster: BASIC ATTACK – for a change, it’s Egwene on the receiving end, taking one damage to the body and spending one survival to prevent a heavy injury to the leg. The trap card cancels all other hits. Egwene is doomed (meaning she can’t spend survival until the trap is resolved) and attacked, taking a heavy hit to the head and the body and getting knocked down. Perrin & Elayne both move to the blind spot… but both fail to hit. 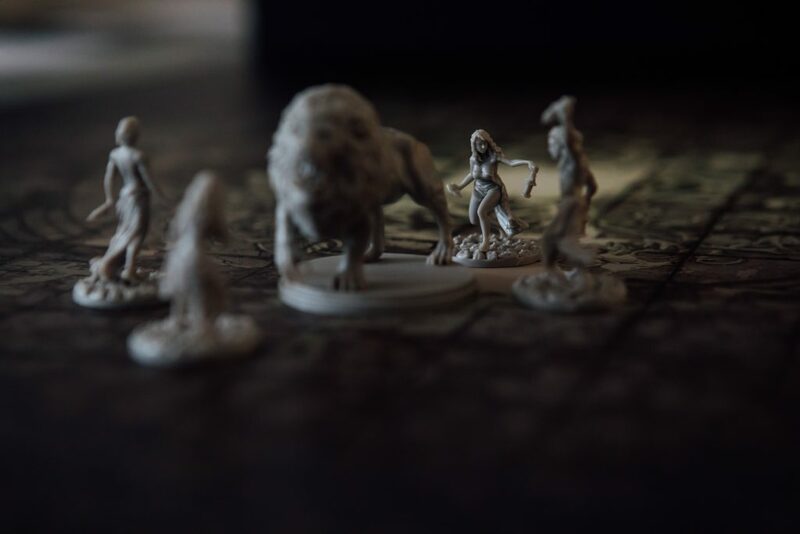 Monster: BASIC ATTACK – Elayne is targeted, forced to spend one survival to avoid taking two hits to her legs and thus rolling on the serious injury table. The lion dies! 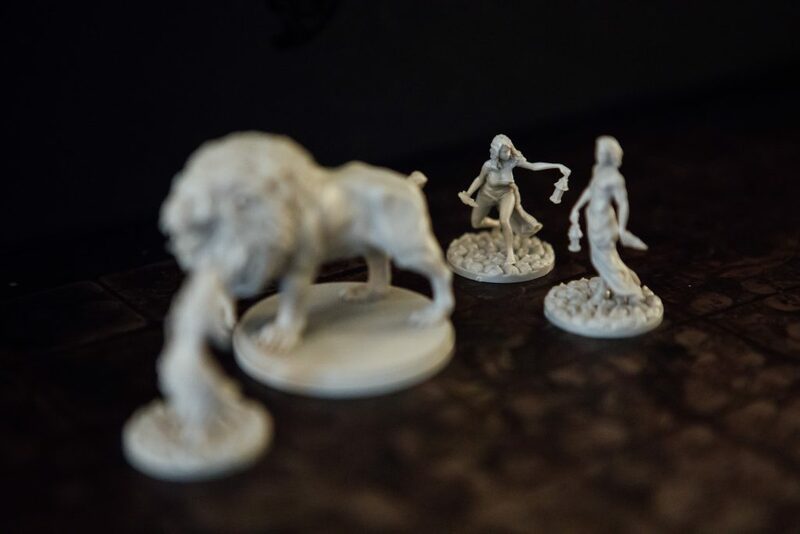 Its corpse yields four White Lion resources and four basic resources. Sort of feels like it should come with a medal or something. 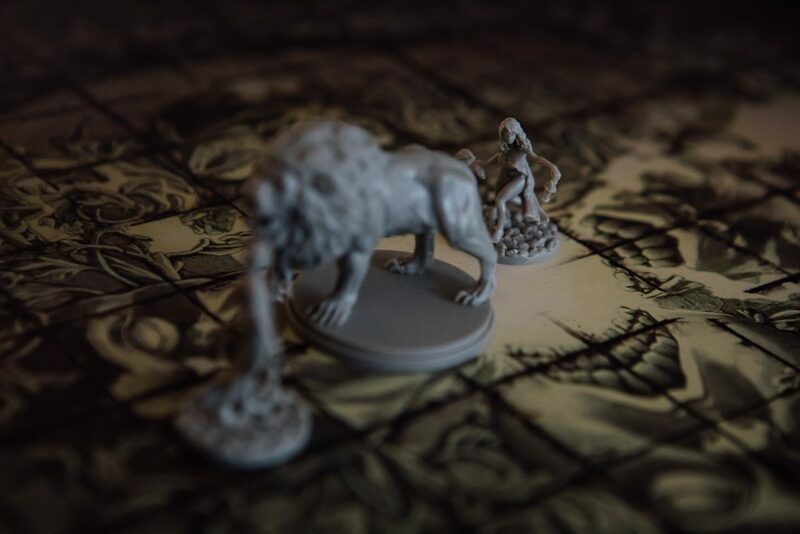 Enjoyed the Kingdom Death Monster prologue? The adventure continues here!